THIS IS A 4 PACK of MORUGA SCORPION MASH. NOW YOU WILL SAVE $1 OFF EACH BOTTLE BUT YOUR SHIPPING SAVINGS U.S. WILL BE ABOUT $16 OVERALL. NOW IF YOUR INTERNATIONAL OR CANADA YOU SAVE A LOT MORE ON SHIPPING. EXAMPLE INTERNATIONAL FOR ONE JAR IS ABOUT $40. NOW IF YOU BUY 4 JAR MULTIPACK IT'S ABOUT $48!! CANADA 1 JAR $27. CANADA 4 JAR MULTIPACK $33. FERMENTED MASH IF NOT OPENED LASTS A LONG TIME. SO BUY MORE AND SAVE! This is a fermented pure Pepper mash of the famous MORUGA SCORPION Pepper. There is less than 5% salt. This is one of the hottest peppers in the world! 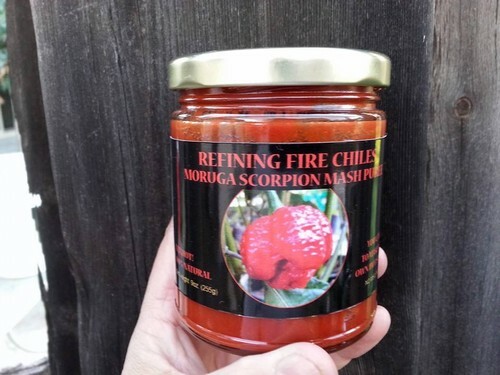 You are buying 9 ounces pretty much pure Moruga Scorpion peppers. This is not a finished product like a sauce. It is designed to be used to make a sauce or added to other food products. This pure concentrated Moruga Scorpion mash should be kept out of the reach of children or pets. Utensils should be washed thoroughly. If it gets on hands or skin wash with cold soapy dishwater. Do not wash with warm water as it opens pores of skin. If you use in high heat cooking do in well ventilated area as fumes can cause coughing. Respect this mash! Don't play jokes with it and don't eat it by itself unless you are one of those crazy people that have the highest tolerance for heat!! Contact us for wholesale sizes of 1 Gallon, 5 Gallon and 55 Gallon Drums.